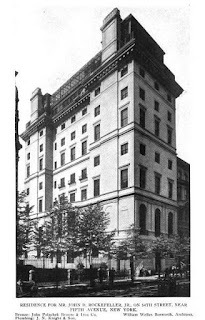 The John D. Rockefeller Jr. residence designed by William Welles Bosworth c. 1913 at 10 West 54th Street in New York City. Rockefeller moved to 740 Park Avenue in 1936 and this townhouse was demolished in 1938. 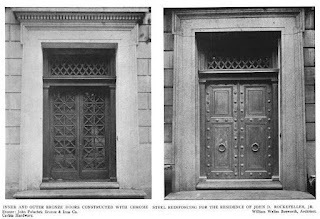 The Rockefeller family had a series of properties on West 54th Street, click HERE for Christopher Gray's Streetscapes article on the block. 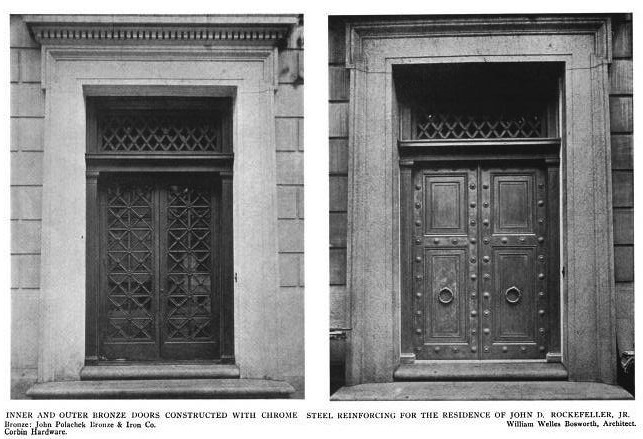 Photos from Architecture & Building, 1913. It's so, so very TALL. why was it so big and on a side lot? Rockefeller is the epitome of wealth in the US and they couldve easily got a whole block, but they instead opted out to live in apartments,ugh. Honestly ive never even heard a Rockefeller mansion in Manhattan. They did have the whole block. They bought up all the surrounding land before this area became too unfashionable for private mansions and JDR Jr rented George Brewsters Park Ave duplex. I think one of the townhouses is a museum or something. Definitely still there. The reason you've never heard of a Rockefeller mansion in Manhattan is because they were torn down for the Museum of Contemporary Art. Daytonian in Manhattan wrote a wonderful post about the properties on Rockefeller block, focusing on Sr.'s mansion. Some of the interiors of the JDR, Sr., mansions (which was next door) are in the Brooklyn Museum. This house was the original home of MoMA. That thing is a beast, anyone know what the SF was?